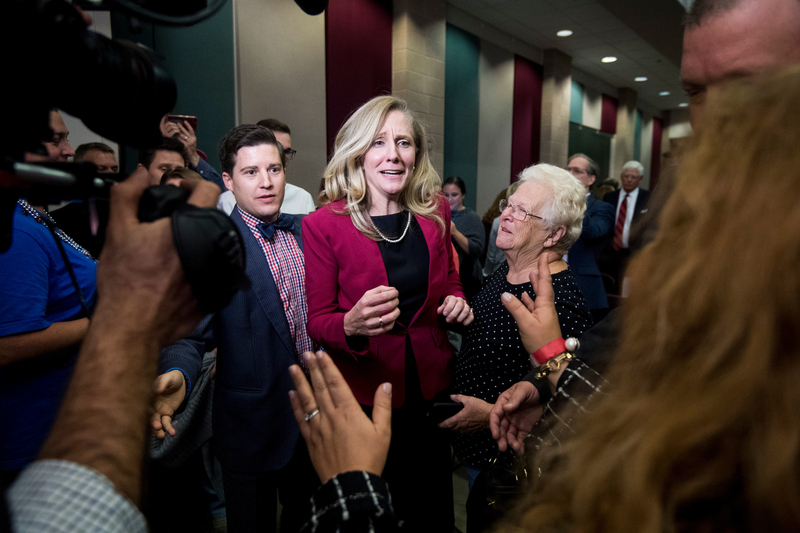 But Spanberger is not the only Virginia Democratic woman who would represent a first on Tuesday. Democrat Leslie Cockburn, a former investigative journalist, would become the first woman to represent Virginia’s 5th District if she beats Republican distillery owner Denver Riggleman. Inside Elections rates that race Likely Republican. Two other Democratic women are running in Virginia districts that are in play this cycle, Jennifer Wexton in the 10th District and Elaine Luria in the 2nd District. Both of those districts have had Republican women representatives but never a Democratic congresswoman. Wexton is the only one of those four candidates running against a woman, incumbent GOP Rep. Barbara Comstock. Inside Elections rates the contest Tilt Democratic. Luria, a retired Navy officer, is running against GOP Rep. Scott Taylor in the 2nd District. Inside Elections rates the race Tilt Republican. In the solid Republican 1st and 6th Districts, Democrats Vangie A. Williams and Jennifer Lynn Lewis are running against Republican Rep. Rob Wittman and GOP candidate Ben Cline, respectively. That makes a total of six women Democratic candidates running in more than half of Virginia’s 11 congressional districts. “Six women; five first-time candidates — it’s kind of a real grassroots bunch that have said, ‘Hey, at this moment in our nation’s history, we need to be at our best.’ I really have enjoyed getting to know all of them and campaigning for them,” Virginia Sen. Tim Kaine said. The candidates too have been celebrating their fellow women running for federal office. “I feel very excited about all these women running in Virginia,” Cockburn said of her fellow candidates during a get-out-the-vote event in Madison Friday. Their congressional campaigns follow a record number of women elected to the Virginia General Assembly in 2017. Pamela Northam, wife of Virginia Gov. Ralph Northam, brought that up during a Spanberger rally here in Richmond Friday night. She also noted that her husband appointed the state’s first majority-female cabinet. More women have become politically active in the wake of the Me Too Movement against sexual assault and harassment. In what many have dubbed a “year of the women,” more than half of the candidates in the Democratic Congressional Campaign Committee’s Red to Blue program for strong recruits are female. Spanberger, Cockburn, Wexton and Luria are all on the Red to Blue list. “The real reason that I value diversity of any sort in the legislative body is because everyone’s perspectives — whether it be where they grew up or who they are, what their background is, what their religion is or what their gender is — it informs aspects of how you view the world and how you address problems and problem-solving,” Spanberger said in an interview. “There’s a great space for opportunity to bring additional perspectives that’s representative of a lot more experiences across this country,” she added. Spanberger’s perspectives are more moderate than some of the other Democratic women running across the country. She supports strengthening the 2010 health care law and creating a public health insurance option to compete with private plans, not a government-run health care system like the Medicare for All plan progressive Democrats are pushing. The political arms of the New Democrat and Blue Dog Coalitions have both endorsed Spanberger. She’s also talked to to leaders of the bipartisan Problem Solvers Caucus. Despite Brat’s attempts to tie his opponent to House Minority Leader Nancy Pelosi, Spanberger has said she won’t support Pelosi for speaker. Spanbergers’ supporters cite her independent streak as a reason why they think she’ll make a good congresswoman. Larkin was one of the women that Brat infamously accused of being in “his grill” during the health care debate last year. While Larkin has found Brat to be inaccessible, she said Spanberger has been listening to all sides throughout her campaign and has demonstrated a willingness to collaborate. Brat’s campaign did not respond to several requests to meet up with him on the campaign trail, and he does not list public events posted on his website or social media accounts. Teresa and Tim Maupin of Lakeside also expressed disappointment in their congressman. Tim Maupin, who voted for Brat the when he first ran in 2014, said he emailed the congressman several times to voice concerns about health care and other issues but only ever got a form response. Health care is especially important to the Maupins because Tim was laid off in 2016 and had to get on one of the plans offered through the health insurance exchanges created under the 2010 law. There were several options that first year he enrolled but last year there was only one option for Henrico County. Maupin worried that legislation House Republicans passed and Brat supported would have left him without any options. Teresa Maupin said she’s been frustrated with the national political rhetoric and she’s been impressed with the positive campaign Spanberger has run. “I just feel like she’s going to go up there [to Washington] and do some very good things,” she said.